Treadwell provides access to Covidence, an online platform that aims to accelerate the systematic review process, at no cost to MGH employees. MGH employees can also invite individuals from outside of MGH to collaborate on systematic reviews at no cost. 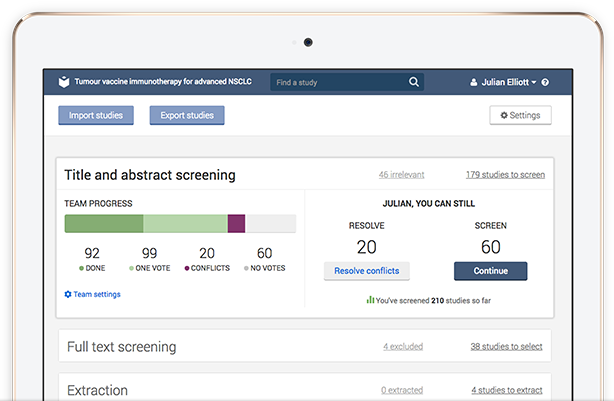 Covidence is accessible by computer or mobile device, and provides one convenient place to screen citations, assess risk of bias, and extract data. To access Covidence, request an invitation here using your mgh.harvard.edu or mghihp.edu e-mail address. Do not use your partners.org address. For videos and written instructions to help you get started with Covidence, see our support page in the Covidence Knowledge Base.